40 years ago today snow storm hits Las Vegas. 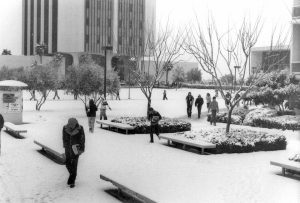 A winter storm dumped 7.4 inches of snow on the valley floor on January 31, 1979. The Clark County School District closed the schools and sent everyone home. One of the worst snowstorms in Las Vegas history smothered the valley Wednesday, closing schools and McCarran International Airport, forcing power lines and causing more than 150 traffic accidents. As of 10 p.m. Wednesday 7.2 inches of snow had fallen in the valley and 6 inches were on the ground at McCarran. Not since Jan. 25, 1949, when nearly five inches of snow fell, has the city been stung by such crippling snowstorm. More than eight inches blanketed the city Jan. 4-5 in 1974, but that storm was not as intense as the one barreling through the valley Wednesday. The snowfall was the second in three days. Monday, nearly 2 1/2 inches were dumped on the area. Wednesday’s storm, at times reaching near-blizzard conditions, dramatically touched all parts of the city. As gamblers were playing the tables as usual at most busy Las Vegas Strip hotels, the heavy snow delayed incoming flights at McCarran International Airport, forcing it to close down at 9 p.m. because of icy runways and poor visibility, a spokesman said. For the first time in recent memory, all 107 public schools in the Clark County School District will be closed Thursday. Classes at UNLV also have been canceled.